2-2:45PM SATURDAY, JUNE 8 Tween and Teen Drawing Class with Jennifer Allen ﻿Graphic designer and drawing instructor Jennifer Allen shows kids, ages nine and up, basic drawing techniques. Using Stan Lee's How to Draw Comics, she'll teach kids how to recreate their favorite comic book heroes. WORKSHOP DETAILS Cost: $15 Supplies included Registration and pre-payment at 480-730-0205. ABOUT THE INSTRUCTOR JENNIFER ALLEN is a local graphic designer with more than a decade of experience. She teaches children's beginning drawing classes from her home studio, and foundational drawing classes at colleges for freshman and sophomore students. Stan Lee signs Election Daze. Comic Legend Stan Lee presents and signs Election Daze: What Are They Really Saying? Former president and chairman of Marvel Comics Group. Co-created the Fantastic Four, X-Men, Hulk, Spiderman, Iron Man, Thor, Daredevil, Dr. Strange. Worked for Marvel's predecessor Timely Publications. Stan Lee's book Iron Man 2 was available from LibraryThing Early Reviewers. Stan Lee is currently considered a "single author." If one or more works are by a distinct, homonymous authors, go ahead and split the author. 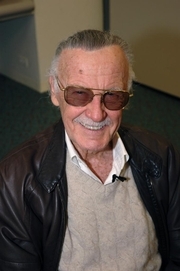 Stan Lee is composed of 3 names. You can examine and separate out names.